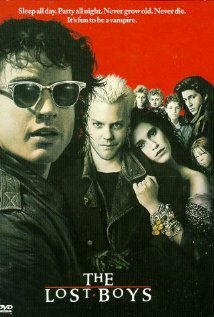 The Lost Boys is one of my all time favorites. It is the vampire movie that defined the 80’s. While it is not necessarily a horror flick, how could it not be included in this years 31 Days? The title of the film is a reference to the companions of Peter Pan, who remained forever young. The original screenplay written by Janice Fischer and James Jeremias was originally about a bunch of “Goonie-type 5th-6th grade kid vampires”, with the Frog Brothers being “chubby 8 year old cub scouts”, and Star being a boy instead of a love interest. Joel Schumacher hated that idea and told the producers he would only sign on if he could change them to teenagers, as he thought it would be more much sexier and interesting. This movie invented the phrase “vamp out”, which has passed into common usage on Buffy the Vampire Slayer. Kiefer Sutherland was only meant to wear the black gloves he wears as David when riding the motorbike. However, while messing around on the bike behind-the-scenes, he fell off, breaking his arm so he had to wear the gloves through the whole movie to cover his cast. The names of the Frog brothers, Edgar and Alan, are a reference to Edgar Allan Poe, the well-known writer of horror fiction. Characters in the movie say the name ‘Michael’ approximately 118 times. When Max first arrives at Sam, Lucy and Michael’s house for dinner he does not enter until invited in by Michael. This echoes many vampire films in that, according to vampire myths, vampires must be invited in before they can enter someone’s home. The movie was filmed in Santa Cruz, CA. Santa Cruz in Spanish means “Holy Cross,” which is an interesting connection given the vampire subject matter and their vulnerability to crucifixes. In the opening sequence there is a random crowd shot that includes an older man in the distance with thick glasses wearing a Gothic looking hooded black robe. While his appearance is in line with the “spooky” factor of the film, he is in fact a semi-nomadic Christian (that this poster knows from having personally met the individual). It is not shown for long, but Laddie is a missing boy, the boy on the milk carton that Lucy picks up off the floor. He is not any relation to Star, just a boy the vampires picked up as a companion for Star. Both of the two 1987 movies about a “family” of attractive vampires who lure a young man and make him into a half-vampire before he is eventually “cured” (Near Dark and The Lost Boys) feature a son of Jason Miller in their casts: Joshua John Miller is in Near Dark, and his half-brother Jason Patric is in The Lost Boys. Both the bandstand that the band is playing on the first time Michael sees Star and the Frog Brothers comic book shop were destroyed in the 1989 Loma Prieta earthquake. This was Corey Haim and Corey Feldman’s first film together, which marked the start of a popular 80s trend “The Two Corey’s” in which Corey Feldman and Corey Haim starred together in a number of teenage films. David is impaled on a pair of antlers and doesn’t disintegrate like the other vampires. Despite what Max later says, he is not really dead. This was intended to be picked up in the sequel, “The Lost Girls”, which was scripted but never made. In the Wildstorm comic’s mini-series “The Lost Boys: Reign of the Frogs” (2008) – which helps bridge the 20-year gap between films – it’s implied that ‘David’ not only survived the impaling but went on to create ‘Shane’ the head vampire in Lost Boys: The Tribe. The movie didn’t originally end on a joke. After the scene with Grampa at the refrigerator, it was supposed to cut to the surviving Lost Boys regrouping in the sunken hotel. The last shot was of a mural on the wall, made in the early 1900s, with Max in it – looking exactly the same as he did today. All of this appeared in an early draft of the script, but ultimately was never filmed. In the cave of the Lost Boys you can see a poster of Jim Morrison who recorded the original version of “People are Strange” with The Doors. And when Star and Laddie are being carried into Sam’s room, you can see a poster of Echo & the Bunnymen who recorded the version used in the movie. The merry-go-round sequence foreshadows the order in which the Lost Boys die. Marko dies first, Paul second, Dwayne third and David last.